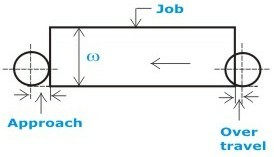 Depth of the job(d): cm. In cutting operations usually the value of Over-Run is taken as 5 mm. In facing operation to face the width of job w respective cuts are required if D(the Diameter of cutter) is less than w(the width of job). And usually the Approach Length is taken as 0.5 D and Over-Run as 7 mm in this case.